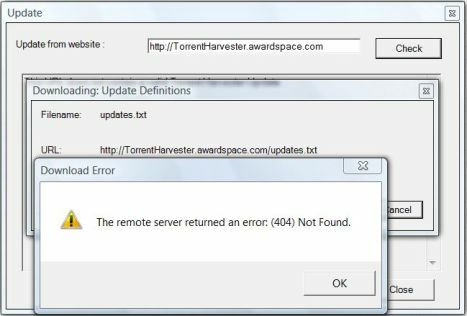 Torrent Harvester, a torrents searcher program to search on multiple torrent trackers websites, had have a rough ride, where the project original website at TorrentHarvester.awardspace.com appeared to be dead and no longer accessible with connection failed or connection refused error. Thus, the supported engines or search engine definitions for TH (Torrent Harvestor) to work properly in case there are site-redesign or sites no longer exist or new sites that need inclusion, can no longer be updated. In Torrent Harvester, users can perform a refresh update on search engines available by downloading definitions update from Torrent Harvester website. But, the default update link URL points to original website which is a dead link. When users click on “Check for Updates” from Help menu, an Update window will appear. Once they click on “Check” button, the following download error messages will appear: “The remote server returned an error: (404) Not Found.” or “The underlying connection was closed: Unable to connect to remote server.” You will get a message “This URL does not contain a valid Torrent Harvester Update” too on update result box. Click on Help on menu bar, and then Check for Updates from drop down menu. An Update winodw will appear. Change the link URL contains inside Update from website text box from http://TorrentHarvester.awardspace.com to http://www.torrent-harvester.com. Click on Check button when done to attempt to update again. Torrent Harvester should download the new definitions and automatically update the engines list. Note: If you’re using proxy the update will fail. In this case you have to manually update the engines by downloading engines package.